Today’s reminder that mother nature is scarier than you think comes from Waterville Valley, New Hampshire, where a Subaru collided with a moose and got completely destroyed. Last night shortly after 9:00PM a motorist struck a moose on Route 49 near 3-mile. The 19 year old driver was transported to Speare Memorial Hospital with multiple non-life threatening injuries. This is one of the most severe car vs moose accidents in recent memory. The driver was very lucky. The cow moose died at the scene and was donated to a local family. 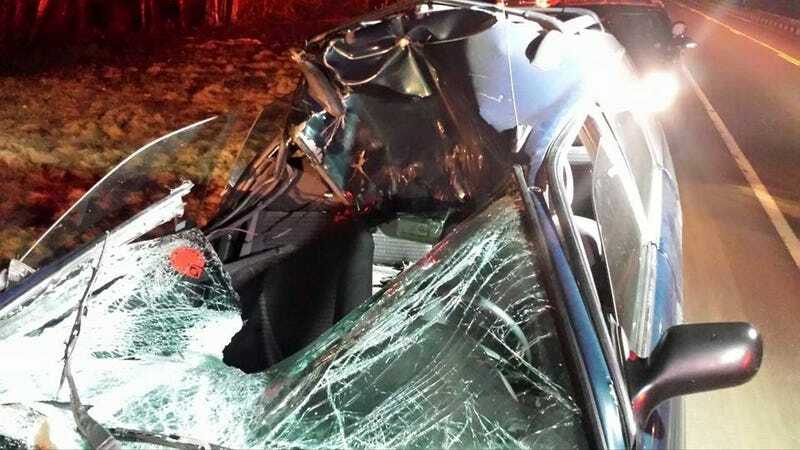 Moose can weigh as much as 800 pounds and be nearly seven feet tall at the shoulder, so frankly, it’s kind of incredible that the driver was okay.